You are currently browsing the archives for the Sanctuary States category. Please, please, please, please, please let Tim Walz be the DFL candidate for governor. This afternoon, Tim Pawlenty sent out an email stating that Tim Walz answered a questionnaire from Our Revolution Minnesota. Reading through Our Revolution Minnesota’s news & headlines page, it’s pretty clear that this isn’t a moderate, center-left organization. One post is titled Our Revolution MN Endorsements: Ellison, Kulp, Phifer. The next post is titled Our Revolution MN Endorses Jeff Erdmann. It’s obvious that they’re far left radicals. Really? I mean that’s just nutty. And it’s not safe. It’ll take away tools from police officers who are trying to get criminals off the streets. When you turn on the news and you see things like a 90-year old farmer from Carver County who was robbed and beaten to death in his home by two illegal immigrants, Tim Walz’s plan makes even less sense. In fact, it’s dangerous. There’s a better way forward. I’ll bring common sense and accountability back to government. It isn’t a stretch to say that Tim Walz sold his soul to run for governor. He used to have a great rating with the NRA. 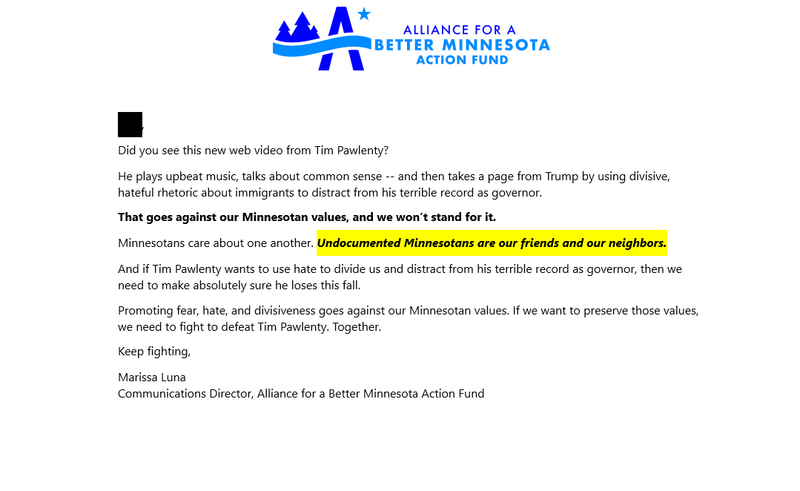 Now he’s trashing them because being on good speaking terms with the NRA isn’t allowed if you’re a DFL candidate for governor. Walz crafted an image of being sensible while in Congress. (He wasn’t sensible but that’s the image he crafted.) Running as the ‘Sanctuary State Candidate’ won’t help Walz’s carefully-crafted image. This isn’t something Walz can dodge, either. I’m told that there’s visual proof of Walz’s sanctuary state statement. That puts Walz in an impossible position. If he denies making the statement, the visual proof is produced, which destroys Walz’s credibility. 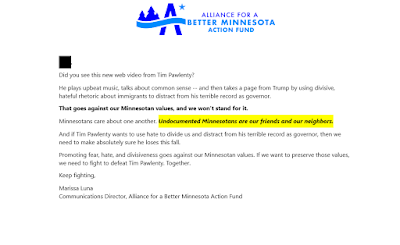 If Walz proudly states that he supports Minnesota as a sanctuary state, he turns off people in rural Minnesota, who expect laws to be enforced. Couple Walz’s sanctuary state policy with the refugee resettlement crisis and you’ve got the potential for lots of hostility directed at Rep. Walz. That’s a can’t-win situation. When I first read this op-ed, I didn’t take it seriously. Then I reread it. This time, the second time was the charm. While I’m far from agreeing with each of the opinions expressed by the author, I’m not dismissing them either. Eventually, people won’t tolerate being ignored. That’s often where backlashes start. I’d certainly make a persuasive argument that that’s where Trump’s backlash came from. In 2015-16, people in Pennsylvania, Michigan and Wisconsin switched allegiances in the presidential election. If high taxes, overregulation and dealing with a homeless/illegal immigration crisis isn’t enough to spark a backlash, nothing will. On a more serious note, if Democrats don’t flip a bunch of seats in California, their blue wave won’t swamp the Republicans. It’s that simple.